In Christianity, heaven is traditionally the location of the throne of God as well as the holy angels. In traditional Christianity, it is considered to be a physical place in the afterlife. In most forms of Christianity, Heaven is also understood as the abode for the righteous dead in the afterlife, usually a temporary stage before the resurrection of the dead and the saints' return to the New Earth. In the Book of Acts, the resurrected Jesus ascends to heaven where, as the Creed states, he now sits at the right hand of God and will return to Earth in the Second Coming. Various people have been said to have entered heaven while still alive, including Enoch, Elijah and Jesus himself, after his resurrection. According to Roman Catholic teaching, Mary, the mother of Jesus, is also said to have been assumed into heaven and is titled the Queen of Heaven. In the Christian Bible, concepts about the future "Kingdom of Heaven" are professed in several scriptural prophecies of the new (or renewed) Earth said to follow the resurrection of the dead—particularly the books of Isaiah and Revelation and other sources of Christian eschatology. The earliest of the Apostolic Fathers, Clement of Rome, does not mention entry into Heaven after death but instead expresses belief in the resurrection of the dead after a period of "slumber" at the Second Coming. A fragment from the early 2nd century of one of the lost volumes of Papias, a Christian bishop, expounds that "heaven" was separated into three distinct layers. He referred to the first as just "heaven", the second as "paradise", and the third as "the city". Papias taught that "there is this distinction between the habitation of those who produce a hundredfold, and that of those who produce sixty-fold, and that of those who produce thirty-fold". According to some views, some Christians in the 1st century believed that the Kingdom of God was coming to Earth within their own lifetimes and looked forward to a divine future on Earth. When the Kingdom of God did not arrive, according to this hypothesis, championed by Bart Ehrman (2006), Christians gradually refined their hopes so that they came to look forward to an immediate reward in heaven after death, rather than to a future divine kingdom on Earth–despite the churches' continuing to use the major creeds' statements of belief in a coming resurrection day and world to come. In the 2nd century AD, Irenaeus (a Greek bishop) wrote that not all who are saved would merit an abode in heaven itself. Eastern Orthodox icon depicting Christ enthroned in heaven, surrounded by the ranks of angels and saints. At the bottom is Paradise with the Bosom of Abraham (left), and the Good Thief (right). The teachings of the Eastern Orthodox and Oriental Orthodox communions regarding the Kingdom of Heaven, or Kingdom of God, are basically taken from scripture, and thus many elements of this belief are held in common with other scriptural faiths and denominations. Eastern Orthodox cosmology perceives heaven as having different levels (John 14:2), the lowest of which is Paradise. At the time of creation, paradise touched the earth at the Garden of Eden. After the Fall of man, paradise was separated from the earth, and mankind forbidden entry, lest he partake of the Tree of Life and live eternally in a state of sinfulness (Genesis 3:22-24). At his death on the Cross, the Orthodox believe Jesus opened the door to Paradise to mankind again (Luke 23:43), and the Good Thief was the first to enter. Various saints have had visions of heaven (2 Corinthians 12:2-4). The Orthodox concept of life in heaven is described in one of the prayers for the dead: "…a place of light, a place of green pasture, a place of repose, from whence all sickness, sorrow and sighing are fled away". However, in the Eastern Orthodox and Oriental Orthodox, it is only God who has the final say on who enters heaven. In the Eastern Orthodox Church, heaven is part and parcel of deification (Theosis), the eternal sharing of the divine qualities through communion with the Triune God (reunion of Father and Son through love). The Catholic Church teaches that "heaven is the ultimate end and fulfillment of the deepest human longings, the state of supreme, definitive happiness". It holds that, "by his death and Resurrection, Jesus Christ has 'opened' heaven to us. The life of the blessed consists in the full and perfect possession of the fruits of the redemption accomplished by Christ... Heaven is the blessed community of all who are perfectly incorporated into Christ." "In the glory of heaven the blessed continue joyfully to fulfill God's will in relation to other men and to all creation. Already they reign with Christ; with him 'they shall reign for ever and ever' (Rev 22:5)." All of those who have made it to Heaven, recognized by the Church or not, are Saints or the Church Triumphant. Heaven is considered a state, a condition of existence, rather than a particular place somewhere in the cosmos. Pope John Paul II declared: "The 'heaven' or 'happiness' in which we will find ourselves is neither an abstraction nor a physical place in the clouds, but a living, personal relationship with the Holy Trinity. It is our meeting with the Father which takes place in the risen Christ through the communion of the Holy Spirit." Those Christians who die still imperfectly purified must, according to Catholic teaching, pass through a state of purification known as purgatory before entering heaven. We all experience that when people die they continue to exist, in a certain way, in the memory and heart of those who knew and loved them. We might say that a part of the person lives on in them but it resembles a "shadow" because this survival in the heart of their loved ones is destined to end. God, on the contrary, never passes away and we all exist by virtue of his love. We exist because he loves us, because he conceived of us and called us to life. We exist in God's thoughts and in God's love. We exist in the whole of our reality, not only in our "shadow". Our serenity, our hope and our peace are based precisely on this: in God, in his thoughts and in his love, it is not merely a "shadow" of ourselves that survives but rather we are preserved and ushered into eternity with the whole of our being in him, in his creator love. It is his Love that triumphs over death and gives us eternity and it is this love that we call "Heaven": God is so great that he also makes room for us. And Jesus the man, who at the same time is God, is the guarantee for us that the being-man and the being-God can exist and live, the one within the other, for eternity. According to Pope John Paul II, "The New Testament amplifies the idea of heaven in relation to the mystery of Christ. To show that the Redeemer's sacrifice acquires perfect and definitive value, the Letter to the Hebrews says that Jesus "passed through the heavens" (Heb. 4:14), and "entered, not into a sanctuary made with hands, a copy of the true one, but into heaven itself" (ibid., 9:24). Since believers are loved in a special way by the Father, they are raised with Christ and made citizens of heaven... After the course of our earthly life, participation in complete intimacy with the Father thus comes through our insertion into Christ's paschal mystery..."
The Catechism of the Catholic Church indicates several images of heaven found in the Bible: "This mystery of blessed communion with God and all who are in Christ is beyond all understanding and description. Scripture speaks of it in images: life, light, peace, wedding feast, wine of the kingdom, the Father's house, the heavenly Jerusalem, paradise: 'no eye has seen, nor ear heard, nor the heart of man conceived, what God has prepared for those who love him'." The happiness of the union with God that is heaven is called the "beatific vision": "Because of his transcendence, God cannot be seen as he is, unless he himself opens up his mystery to man's immediate contemplation and gives him the capacity for it. The Church calls this contemplation of God in his heavenly glory 'the beatific vision'." 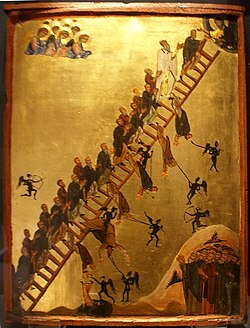 Some denominations teach that one enters heaven at the moment of death, while others teach that this occurs at a later time (the Last Judgment). Some Christians maintain that entry into Heaven awaits such time as "When the form of this world has passed away." Two related and often confused concepts of heaven in Christianity are better described as the "resurrection of the body" as contrasted with "the immortality of the soul". In the first, the soul does not enter heaven until the last judgement or the "end of time" when it (along with the body) is resurrected and judged. In the second concept, the soul goes to a heaven on another plane immediately after death. These two concepts are generally combined in the doctrine of the double judgement where the soul is judged once at death and goes to a temporary heaven, while awaiting a second and final judgement at the end of the world. Some teach that death itself is not a natural part of life, but was allowed to happen after Adam and Eve disobeyed God so that mankind would not live forever in a state of sin and thus a state of separation from God. Not only will the believers spend eternity with God, they will also spend it with each other. Revelation describes a New Jerusalem which comes from Heaven to the New Earth, which is seen to be a symbolic reference to the people of God living in community with one another. 2 Corinthians said that Paradise is located in the Third Heaven. That heaven is a material place where God resides. That God sent his son, Jesus Christ to earth to live as a human being, but who "perfectly exemplified the righteousness and love of God. By His miracles He manifested God's power and was attested as God's promised Messiah. He suffered and died voluntarily on the cross for our sins and in our place, was raised from the dead, and ascended to minister in the heavenly sanctuary in our behalf." That Christ promises to return as saviour at which time he will resurrect the righteous dead and gather them along with the righteous living to heaven. The unrighteous will die at Christ's second coming. That after Christ's second coming there will exist a period of time known as the Millennium during which Christ and his righteous saints will reign and the unrighteous will be judged. At the close of the Millennium, Christ and his angels return to earth to resurrect the dead that remain, to issue the judgements and to forever rid the universe of sin and sinners. "On the new earth, in which righteousness dwells, God will provide an eternal home for the redeemed and a perfect environment for everlasting life, love, joy, and learning in His presence. For here God Himself will dwell with His people, and suffering and death will have passed away. The great controversy will be ended, and sin will be no more. All things, animate and inanimate, will declare that God is love; and He shall reign forever." It is at this point that heaven is established on the new earth. Jehovah's Witnesses believe that heaven is the dwelling place of Jehovah God and his spirit creatures. Rather than the traditional view that all Christians go to heaven, they believe that only 144,000 chosen faithful followers will be resurrected to heaven to rule with Christ over the majority of mankind who will live on Earth. M'Clintock and Strong's Cyclopaedia (1891, Vol. IV, p. 122) comments: "In Isa. Ixv, 17, a new heaven and a new earth signify a new government, new kingdom, new people." The primary purpose of Jesus' illustration of the "ten virgins" (Mt 25:1-12) is to teach. It is evident that Jesus was speaking about spiritual virginity, remaining separate from the world, doctrinally pure. (Re 14:4; compare 1 Co 11:2) Of specific interest is that the foolish virgins are avoided deliberately, even though they thought they were keeping themselves morally and doctrinally pure. (Mt 7:21-23; 25:12) New Jerusalem is believed to be the final abode of souls redeemed by Christ, and an ideal earthly community. According to Webster's Collegiate Dictionary—Revelation 3:12; 21:2 (1985); also compare with Psalms 45:16; Isaiah 32:1. The view of heaven according to the Latter Day Saint movement is based on section 76 of the Doctrine and Covenants as well as 1 Corinthians Chapter 15 in the King James version of the Bible. The afterlife is divided first into two levels until the Last Judgement; afterwards it is divided into four levels, the upper three of which are referred to as "degrees of glory" that, for illustrative purposes, are compared to the brightness of heavenly bodies: the sun, moon, and stars. Before the Last Judgment, spirits separated from their bodies at death go either to Paradise or to Spirit Prison dependent on if they had been baptised and confirmed by the laying on of hands. Paradise is a place of rest while its inhabitants continue learning in preparation for the Last Judgement. Spirit Prison is a place of learning for the wicked and unrepentant and those who were not baptised; however, missionary efforts done by spirits from Paradise enable those in Spirit Prison to repent, accept the gospel and the atonement and receive baptism through the practice of baptism for the dead. The Celestial Kingdom is the highest level, with its power and glory comparable to the sun. Here, faithful and valiant disciples of Christ who accepted the fullness of his gospel and kept their covenants with Him through following the prophets of their dispensation are reunited with their families and with God the Father, Jesus Christ, and the Holy Spirit for all eternity. Those who would have accepted the gospel with all their hearts had they been given the opportunity in life (as judged by Christ and God the Father) are also saved in the Celestial Kingdom. Latter-Day Saint movements do not believe in the concept of original sin, but believe children to be innocent through the atonement. Therefore, all children who die before the age of accountability inherit this glory. Men and women who have entered into celestial marriage are eligible, under the tutelage of God the Father, to eventually become gods and goddesses as joint-heirs with Jesus Christ. The Terrestrial Kingdom's power and glory is comparable to that of the moon, and is reserved for those who understood and rejected the full gospel in life but lived good lives; those who did accept the gospel but failed to keep their covenants through continuing the process of faith, repentance, and service to others; those who "died without law" (D & C 76:72) but accepted the full gospel and repented after death due to the missionary efforts undertaken in Spirit Prison. God the Father does not come into the Terrestrial Kingdom, but Jesus Christ visits them and the Holy Spirit is given to them. The Telestial Kingdom is comparable to the glory of the stars. Those placed in the Telestial Kingdom suffered the pains of Hell after death because they were liars, murderers, adulterers, whoremongers, etc. They are eventually rescued from Hell by being redeemed through the power of the atonement at the end of the Millennium. Despite its far lesser condition in eternity, the Telestial Kingdom is described as being more comfortable than Earth in its current state. Suffering is a result of a full knowledge of the sins and choices which have permanently separated a person from the utter joy that comes from being in the presence of God and Jesus Christ, though they have the Holy Spirit to be with them. Perdition, or outer darkness, is the lowest level and has no glory whatsoever. It is reserved for Satan, his angels, and those who have committed the unpardonable sin. This is the lowest state possible in the eternities, and one that very few people born in this world attain, since the unpardonable sin requires that a person know with a perfect knowledge that the gospel is true and then reject it and fight defiantly against God. The only known son of Perdition is Cain, but it is generally acknowledged that there are probably more scattered through the ages. Emanuel Swedenborg (1688–1772) wrote extensively on the life after death and claimed to have traveled widely in heaven and hell. He said his information was received as revelation from Jesus Christ. Swedenborg states that all angels and evil spirits, as the inhabitants of hell are generally termed, were once people in the physical world. Angels are not gods. Furthermore, far from being ghostly, the people in Heaven and Hell appear to each other as real as we do to each other in this world. Indeed, Swedenborg saw cases where the spirits involved thought they were still in the physical world. People do not go directly to heaven or hell. After death, they first go to what is termed the World of Spirits, halfway between Heaven and Hell. In the World of Spirits everyone goes through a three-stage process  that ends with their choosing, in free will, to go to Heaven or Hell to eternity. This free-will-choice-based system works because an evil person cannot stand the company in heaven, nor can a good person stand the company in hell. Angels, Swedenborg says, are male and female in every respect, just like we are here. Marriage between husband and wife is a central and "very good" component of creation. The quality of the relationship between husband and wife starts out the same in the spiritual world as it was at their death in this world. Thus, an angel couple in true spiritual love will live literally happily ever after, to eternity in heaven, according to Swedenborg, although contrary to the teachings of Paul's Epistles. A couple in which one or both partners lacks such love will initially live together after death and then separate and find new compatible partners. A person who loved the ideal of spiritual marriage but never found a partner in this world will find one there. Finally, as might be expected, an evil spirit receives no such partner. All children who die go directly to heaven, where they are raised by angel mothers. Heaven is organized into groups, called societies, bound by common affections. The societies range in size from small to large, like towns and cities here. An entire angelic society sometimes appears in the form of an angel, such as Michael and Gabriel. Thus, for instance, Gabriel is not an archangel, but a society in heaven whose ministry is teaching from the Word. One of the people they taught was Mary in the annunciation. All in heaven speak the same language, which they know instinctively without learning it. Angels have power from God. In fact, a single angel can command hundreds of thousands of evil spirits. There is no time or space as we know it in heaven. Location and movement are determined by mental state. If, for instance, you think about seeing a friend, that friend appears. Neither of you has physically moved, but you have changed your state of mind relative to whatever or whoever you wish to see. ^ 1 Clement "26:2 For he saith in a certain place, And thou shalt raise me up, and I will give thanks unto thee; and again: I slumbered and slept; I arose up because thou art with me." ^ E. C. Dewick, Tutor and Dean of St. Aidan's College, Birkenhead, and Teacher in Ecclesiastical History in the University of Liverpool. Primitive Christian Eschatology: The Hulsean Prize Essay for 1908 2007 reprint Page 339 "resurrection is 'that which shall be hereafter' ; and neither salvation nor resurrection will be accomplished till the Lord has come again"
^ Book for Commemoration of the Living and the Dead, trans. Father Lawrence (Holy Trinity Monastery, Jordanville NY), p. 77. ^ Moody, D.L. Heaven. Liskeard, Cornwall: Diggory Press, 2007. ISBN 978-1-84685-812-3. ^ Bunyan, John. The Strait Gate: Great Difficulty of Going to Heaven Liskeard, Cornwall: Diggory Press, 2007. ISBN 978-1-84685-671-6. ^ Bunyan, John. No Way to Heaven but By Jesus Christ Liskeard, Cornwall: Diggory Press, 2007. ISBN 978-1-84685-780-5. ^ Reasoning From The Scriptures. Watchtower. 1989. ^ Swedenborg, E Heaven and its Wonders and Hell. From Things Heard and Seen (Swedenborg Foundation, 1946). ^ Heaven and Hell#28, 73ff. Gary Scott Smith, Heaven in the American Imagination. New York: Oxford University Press, 2011. Colleen McDannell and Bernhard Lang, Heaven: A History. New Haven: Yale University Press, 1988; 2nd ed. 2001. Bernhard Lang, Meeting in Heaven: Modernising the Christian Afterlife, 1600-2000. Frankfurt: Peter Lang Publishing, 2011. Randy C. Alcorn, Heaven, Wheaton, Tyndale House, 2004. Jerry L. Walls, Heaven: The Logic of Eternal Joy, Oxford, Oxford University, 2002.